A .CA domain name makes your brand, business, company, or personal site instantly recognizable as Canadian to internet users, both locally and around the globe. Canadians statistically prefer doing business with .CA domain names for these reasons. From eCommerce & shopping, to banking, entertainment, news and more – Canadians prefer .CA! Rank higher in local organic searches - save thousands per year! A .CA domain name makes you or your company instantly recognizable as Canadian to Internet users around the world. 89 per cent of Canadian Internet users think it is important for Canadians to have a .CA domain name. Canadians prefer .CA sites over .COM sites for shopping, banking, news, entertainment, education. A .CA domain name is the Canadian flag on your digital backpack. The respect our country enjoys internationally is reflected in your .CA domain name. Canadians are registering their .CA website addresses in such numbers that we’re growing faster here than our counterparts are in almost every other country. In fact, .CA is the fourth-fastest growing domain extension, with over two million .CA domain registrations! Canadians live online. In a recent study by Ipsos Reid that tracked how many hours citizens of eleven major countries spend online each month, Canadians doubled the world average at 45.6 hours per month. The trust and brandability associated with a .CA only continues to grow. In fact, .CA is the 4thfastest growing domain extension in the world. Canadians are also some of the most connected people in the world, more than doubling the world average time spent online each month! 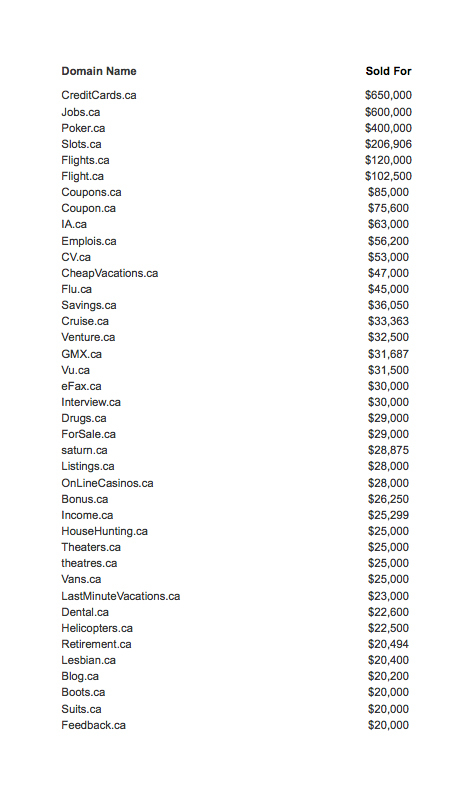 Many of the premium .CA names offered by DomainExchange.ca cannot be found anywhere else on the web! Don’t miss your chance to own a piece of Canada’s waterfront quality web real-estate. Take a look at the CIRA fact book for more great reasons and statistics on the benefits of .CA ownership.